This was certainly a different movie for me and proved to be a joy to work on. I created all of Herbie's physical sounds - squeaks, creaks, boings, and his sputtering engine - while another designer handled his 'vocals'. It was a real challenge to make sound cartoony but still stay away from all of the traditional cartoon sound effects. In the end, the sound really brought the little car to life. 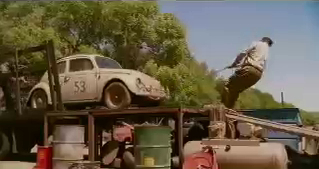 Herbie's less-than-grand entrance in the film. Lost of fun here setting up the cartoony but realistic vibe for the movie . Love the cat screech, too. 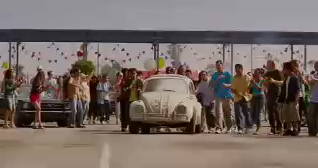 bring Herbie to life. I still can't listen to that car scrape sound at full volume! 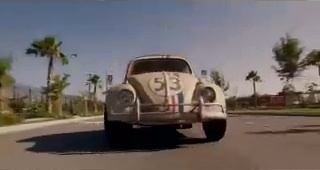 Herbie sputters along as he races against a modern sports car. The engine fly-thoughts are awesome! I cut everything Herbie and another designer cut Tripp's car.